The list of things you don’t need in order to grill great food is a lot longer than the list of what you do need. You don’t need a grill with a built-in sound system and refrigerator. You don’t need lighter fluid (EVER). You don’t need acres of backyard, a brick oven, a secret spice rub, you do need to let me know if you have any questions! Grilling is the simplest, most basic cooking method there is. Lets not talk about the cave man techniques here as I am pretty sure they didn't bother removing all the fur on their meat before umm...grilling. All you really need is food and fire. Of course other things can help: the right ingredients, the right equipment, and the right recipe. The right ingredients are up to you. You don’t need fancy or exotic ingredients to be a great cook. But no one can make great dishes without great ingredients, so I really encourage you to pay attention to the freshness of every last thing you put in your food, even the basic stuff. This is mostly a matter of shopping carefully and often. The spices in your cabinet lose their flavor after a while.That "while" being ABOUT two years. I'd pitch anything that's over a year old! I advise against storing your stuff directly over your oven too! Garlic loses its oomph. “Fresh” fish can be anything but. If it smells fishy then its not fresh. If you are looking at the whole fish the eyes should be clear. Make sure that what you use is as good and fresh as it can be, and I swear you will not be sorry that you spent a little extra time at the market. Don't fall for the unscrupulous local meat market either. If they are selling you meat and forget to mention that it's SELECT quality, look someplace else. When the meat market advertises they will TOUT the grade when it's CHOICE or Angus beef. Do NOT settle for less. Otherwise you'll have pretty tasteless beef. 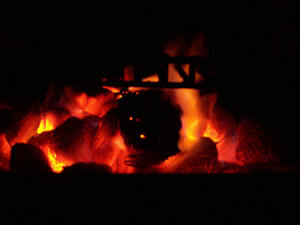 A gas or charcoal grill. I use both, and each one has its advantages. Gas is easy to light, control, and clean. Charcoal is a lot more work, but it gives food a smokiness that gas can never quite imitate. If you use charcoal, you also need a chimney starter: don’t even talk to me about lighter fluid! Of course, whatever grill you use, the grates should be reasonably clean. The tempurature your grill is getting up to will no doubt kill any bacteria on it. A pair of tongs. A spatula for the fis of course. Brushes. I use good-quality paintbrushes from the hardware store and replace them often, since after a while it’s hard to get them clean. If you soak the brushes in soap be sure you get it REALLY rinsed out or you'll have some pretty soapy tasting sauce next time around! The new nylon brushes are pretty good. A work space. Don’t underestimate the importance of having enough room to work. Grilling is much more relaxing when you’re not trying to hold a whole collection of plates and bowls as you do it. If your grill doesn’t have enough workspace (and they almost never do) set up a table right next to your grill. Places like Walmart and Home Depot have small tables that look like they were just made to be your barbecue buddy! The most challenging thing about grilling is: knowing when to stop! I get a lot of questions about doneness, even from very experienced grillers. How do I know when chicken is cooked through? What about fish – is it the same? How about lamb – do I need to use a meat thermometer? Anyone who grills needs to master getting the food off the fire when it’s cooked just right – not too much, not too little, and allowing for a little more cooking to take place after it’s off the heat. So are there hard-and-fast rules? Not really. As with all cooking, it’s a matter of taste, experience, and staying cool under pressure. Rule #1: Don’t start testing the food the minute you put it on the heat! This includes picking it up to see if it’s done on the bottom, moving it around, and turning it over every ten seconds. Put the food down and give it a chance to cook. This will also give it a chance to sear on the bottom so that it naturally pulls away from the grates and doesn’t stick. If you try to move the food before it’s seared on the bottom, it will definitely stick. Rule #2: Don’t cut into your food to see if it’s done. For one thing, it doesn’t really work, since you can’t get a good look at the inside. For another, it lets the juices come pouring out and the food dries out on the grill. The best way to test food is by poking it with your finger. As it cooks, it becomes firmer and firmer. A rare steak feels squishy; a medium steak feels more springy; a well-done steak feels as taut as a trampoline. The rule of “the longer it cooks, the firmer it gets” also holds true for fish and poultry. As you get more and more experienced, you’ll learn exactly what your favorite food should feel like when it’s done. Rule #3: Meat and poultry should rest for at least a few minutes before slicing or serving. What does this mean? Well, without getting too technical about anatomy or chemistry, if you cut into the flesh right as it comes off the heat, the hot juices will run out all over your cutting board. If you wait a few minutes to let them thicken just a bit, they’ll stay in the meat. You may feel like the food is getting cold, but actually it’s still cooking. Cover it up with foil and let it rest for at least 5 minutes. Fish does not need to rest and should be served immediately, as it loses heat very quickly. Rule #4: When in doubt, it’s better to undercook than overcook. You can always put food back on the fire if you need to.You need to do some research on direct and indirect heat grilling methods. on the grill chart. Cast Iron cookware care you ask? CHECK THIS OUT!